Welcome to Yellow Wall Farm. We are a small family farm, located in a secluded fertile valley along the San Lorenzo River in Santa Cruz. 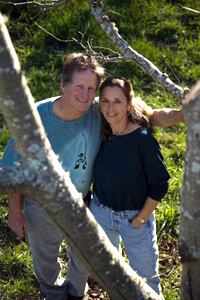 We purchased this blessed property in 1998 and began planting cover crops and pruning the orchard. We were both busy with our first careers so were not able to devote our full attention to the farm. Each year we experimented with our land. One year in celebration of Allen’s daughter, Faith’s, wedding we planted 8,000 sunflowers – all at the same time — so it would be spectacular for her rehearsal dinner. Spring was very cool that year and lasted longer than usual. The flowers bloomed the week after the dinner, and yes, it was spectacular. That lovely yellow wall of sunflowers inspired the name of our farm. The land has been organically farmed for many years. Prior to our owning the land, it was farmed by several local organic farmers. We continued organic farming practices and were certified in 2004. We began farming more and spending less time on our off-farms jobs in 2007. We are currently certified by CCOF. Our farm is just under three acres. The orchard is comprised of many heirloom apple trees that are approximately thirty years old, as well as some younger trees that we have planted. Tree varieties include: peach, apple, asian pear, pear, persimmon, avocado and kiwi, lemon, lime, orange, and blood orange. Our summer field crops include: tomatoes, cucumbers, peppers, beets, kale, chard, broccoli, eggplant, sunflowers, summer and winter squash, pumpkins, decorative gourds, and loads of beautiful flowers. We also sell to several local restaurants and markets. In the summer of 2011, we opened a farm stand, where you will find us on Saturday mornings from August through November. Stay tuned to our Facebook page for details. We are committed to agricultural conservation and excellence in quality produce. Our criteria for excellence includes, flavor, color, smell, feel and taste. In our quest for excellence and preservation of high quality food, we grow several varieties from the Slow Food Ark of Taste. Preservation of our local food system and heritage varieties is a large part of why we farm. And of course it is deeply satisfying work to feed people good food from good land. Thank you for your interest in our farm and our work.